Here at Nintendo Life we're used to reviewing a lot of franchise sequels, as developers and publishers quite rightly give gamers more of what they want. 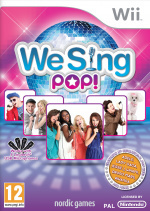 We're not talking Super Mario, however, but rather the We Sing series, a franchise of karaoke games exclusive to Wii. Unfortunately we aren't well-known for angelic singing voices, but we’ve ignored the mocking laughter of others to stumble our way through We Sing Pop and, actually, it’s quite good fun. The premise couldn’t be simpler. Like all the titles in the series, We Sing Pop is fancy karaoke, not only showing you the words to sing over the original music video but also judging your efforts for pitch and timing. 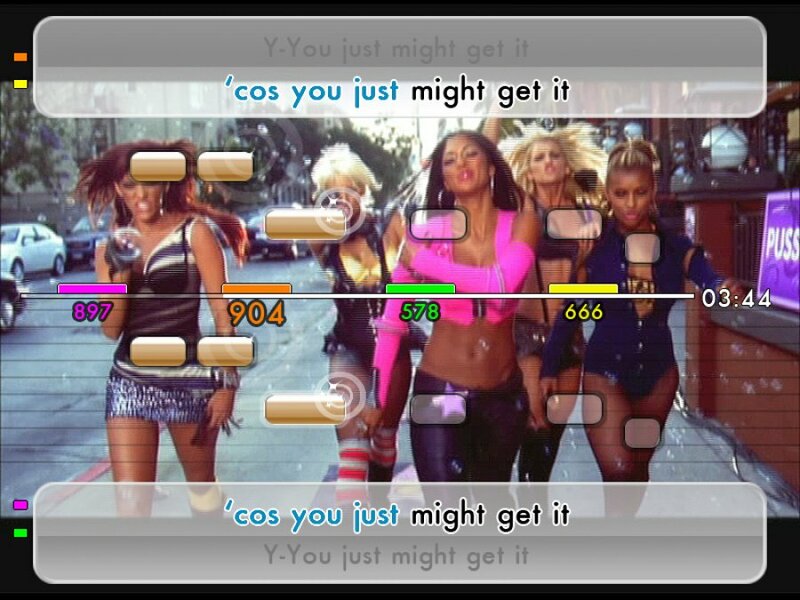 In every mode there are a range of options such as a difficulty setting, singing with the original artist or with just the instrumental track, and even singing just half the song if you’re having a quick game between singing lessons. There may be a dizzying number of menus and game modes to navigate, which are particularly bland to look at, but it’s easy enough to get to the stage where you’re singing your favourite song and trying for a good score. For veterans of karaoke gaming, this title covers most bases to ensure that there’s always something to do. The least desirable option is to play solo, simply because this style of game is far more enjoyable with like-minded friends. If you are singing alone you can set up playlists to work through, or just pick individual tracks to try out, all the while setting new high scores and unlocking some achievements. There are lessons to work through that are pretty darn challenging, but there’s no kind of pop career mode to indulge soloists, just a list of songs to choose from. If you’re playing on your own you’re arguably missing the point, as this is a game to play with others who are also willing to demonstrate some off-key warbling. Every track is available in multiplayer, with some dividing duties normally reserved for a soloist while others have multiple parts. The aptly named Party mode is packed full of options, including standards such as the non-competitive We Sing mode, while Versus and First to X are included for those keen to show that they’re the real deal. 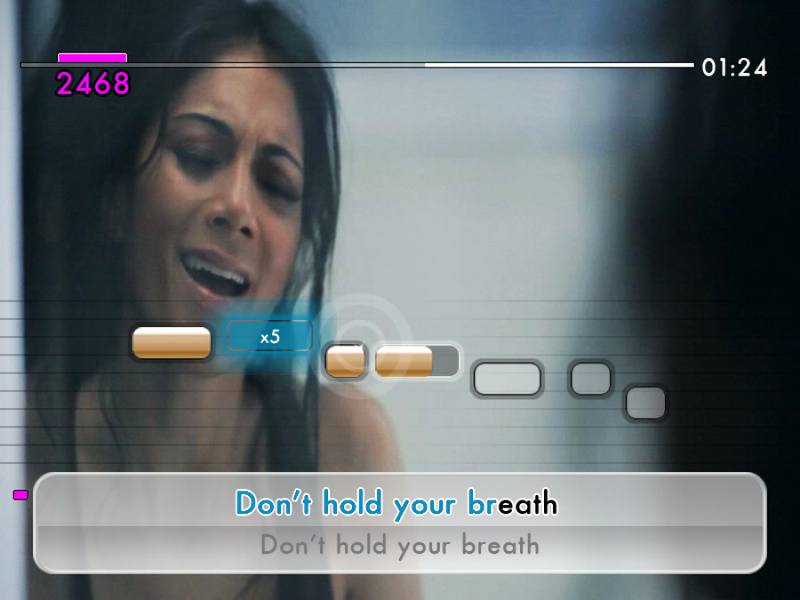 Available in single and multiplayer are Blind and Expert modes, the former randomly taking lyrics off the screen to test your memory, while Expert mode provides no lyrics or pitch bars for guidance: if you want to show how bad you are, Michael Jackson style, then these are the modes for you. What really matters, of course, is the song selection on offer. The 30 tracks included are nothing if not diverse, with some songs accessible to mere mortals and others best left to the professionals. Pop icon of the day Lady Gaga gets special treatment with two entries, while the rest is a mix of old and new songs, with some indie rock and rapping thrown into the mix. Y.M.C.A from Village People and Ice Ice Baby are clearly there for giggles, while Club Can’t Handle Me from Flo Rida is good for showing that you’re not a gaming dinosaur who immediately opts for Vanilla Ice. Some of the tracks are certainly difficult, catering to those who can already sing or who are training their voice to do so: our attempt at Just the Way You Are in the correct pitch seemed to alert a worrying number of dogs in the local area. In terms of how the title performs these tracks, it’s a mixed experience. If you have the relevant Logitech microphones packaged with the game, or any of its predecessors, the experience is solid. After adjusting the sound and microphone settings — mainly to set microphone output volume to 0% — we found that our voice and bad singing was picked up well. As with We Sing Rock, rap songs are picked up brilliantly, with the mic detecting the timing of your words while ignoring pitch. The downside to this is the sound and video quality, which are both questionable. The grainy video ultimately doesn’t matter much, while the soundtrack is fuzzy but bearable when played with the artist’s voice included. If you choose to sing with the instrumental track, however, some songs have clearly been edited poorly. In the process of removing the relevant channel with the artist’s voice, the game distorts the remaining sound: notable examples were Fireflies by Owl City and Love is All Around by Wet Wet Wet, both sounding well below par. Overall, the audio is passable in the best case, and a disappointment if you choose the instrumental option in the wrong song. If playing this as a party game with friends, these issues are unlikely to be too distressing, yet if you earnestly want to sing some of your favourite tracks as well as possible, these limitations can be a let down. 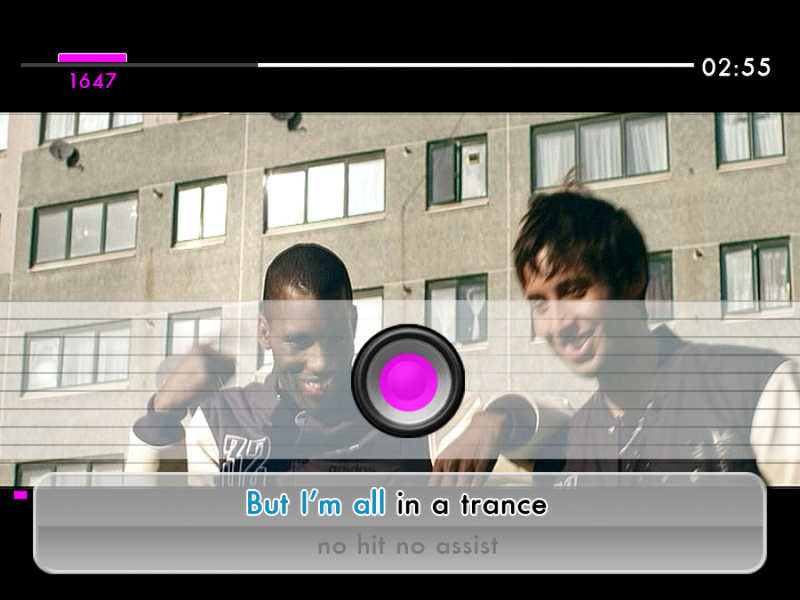 We Sing Pop does exactly what you’d expect from a karaoke game, fleshing out the experience with a variety of modes that make minor adjustments to the basic act of singing along to a song. It’s fun for a party, with modes that allow non-competitive sing-alongs or deadly face-offs, but those playing solo may wish for a basic career mode beyond pointless achievements. A solid track list will keep most going, but be prepared for sketchy sound and video quality. It’s a fun distraction for those who love to sing while, for everyone else, it’s that strange off-key singing that you hear coming from the neighbour’s house. How did Milkshake get into this? A lot of the consumers are likely to be young girls that shouldn't know about songs like that. @FonistofCruxis Yes because it's been such a well-kept secret until now. @James Good point, that song has already been exposed more than it should have been. Karaoke! The greatest invention of our age! Why haven't they made, "We Sing Theatre!"? I would so totally buy that. I saw Lady Gaga. I am buying this game. if the girl in white on the front cover, comes with the game ill buy it. Only have Wii Sing and still haven't touch it. Only picked it up as it was only 2,5 euro with microphone.